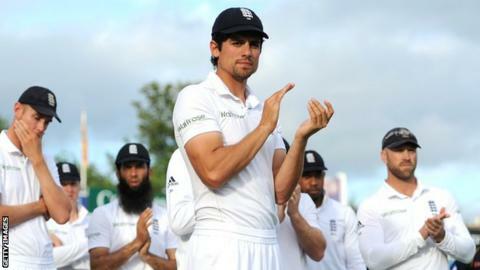 Alastair Cook said he will not resign as England captain despite the 1-0 series defeat by Sri Lanka. Defeat off the penultimate ball in the second Test at Headingley was England's sixth reverse in seven matches following the 5-0 Ashes whitewash. "I've never quit on anything," said Cook. "I'm incredibly proud to be England captain. It's a huge honour and I'm in it for the long haul. "I'm desperate to help turn English cricket around." Cook took charge following Andrew Strauss's retirement in 2012 and immediately led England to a first series win in India for 27 years. "The criticism of Cook is out of order - it's a few people with an agenda against him. But he is under pressure. He needs to find form with the bat and everything will flow from there. "I don't think captaincy is a burden. Alastair is a strong character. It does all seem to be getting a little but too much at the minute. Perhaps that's why people need to support him rather than swinging axes." He followed that with an Ashes triumph but presided over last winter's humiliation down under. "I believe I'm the right man for the job," added the 29-year-old opener. "I've given it my all, all the time. "If someone decides I'm not the right person for the job, then fine." Cook has scored only 601 runs in his past 24 innings at an average of 25, and has been criticised for England's tactics in the field during this series. Former England batsman Geoffrey Boycott said on Monday that Cook's form is a "recipe for resignation". "With runs hard to come by, it does put more pressure on me," Cook said. "There a few technical things I can work on, but it comes down to being mentally strong at the crease. "Everyone knows form can change very quickly. I've done it in the past and I've got to drag that mental strength out again." Cook has played 104 Tests, scored 8,125 runs at an average of 45.90 and made a record 25 centuries for England. He scored hundreds in each of his first five Tests as skipper, but he does not believe his recent slump is linked to the burden of captaincy. "Cook is a really, really nice boy. He's honest and he's straight but his form is suffering. He needs to start scoring runs because it's a results-orientated business. "He has to have some imagination with his captaincy, one plan can't fit into every situation." "When I walk out to bat, I don't think of myself as a captain," said Cook. "Being captain probably makes you more determined to score runs." England's 100-run defeat in the second Test at Headingley came in the cruellest fashion, with number 11 James Anderson falling in the final over. Anderson, who was in tears after the game, survived for 20 overs with Moeen Ali, who made an unbeaten 108, batting through the day to take England from 57-5 to 249 all out. "It was an incredible effort to do that," said Cook. "For Mo to play such a controlled innings in that pressure can only bode well for the future. "For Jimmy to react like that, it shows to everyone who don't know us as blokes what it really means to play for England. "We sometime get accused of not caring that much, but that was raw emotion from a guy who put everything in to that batting effort." "It has been a really tough seven or eight months. None of us take it lightly and he is going to work extremely hard to put it right." Listen to Jonathan Agnew and Geoffrey Boycott analyse the day's play in the Test Match Special podcast.